End-of-life care is never easy, but professionals must be aware of some distinct challenges facing families of addiction. No two families are alike when it comes to end-of-life care. And while every situation has its own challenges, end-of-life care can be further complicated by elements of past or current addiction within the family-under-care’s unit. Whether it’s the patient or a family member who has struggled with addiction, this fact changes the family dynamic and introduces some important considerations for the caregivers providing end-of-life treatment. While there are many variables in these situations, one fact remains constant: A family systems approach to end-of-life care is preferable, not only for families of addiction but for any end-of-life care situation. 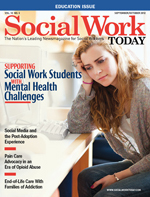 Social Work Today recently spoke with Suzanne Young Bushfield, PhD, MSW, and Brad DeFord, PhD, MDiv, coauthors of End-of-Life Care and Addiction: A Family Systems Approach, who wrote this book to fill a gap around an issue that really wasn’t being discussed. The authors found that people were talking about end-of-life care and talking about addiction, but they weren’t talking about what happens when those two situations come together. We asked Bushfield and DeFord to share some of the key points from their book and explain why a family systems approach is important as well as how social workers might better assist families of addiction who are receiving end-of-life care. What’s important to recognize, Bushfield says, is that when someone in the family has had an addiction, that addiction has affected the family system. Because we don’t exist in a vacuum, our actions affect the rest of the family unit, and it changes the dynamic of those relationships. Bushfield and DeFord have coined the term “addiction emotional process” to talk about the dynamic that addicts and their families experience in dealing with addiction. “If a family member has participated in regular drinking or drug use, the rest of the family is affected by that,” Bushfield says. “In the same way, if they try to change their behavior, those changes affect the whole family as well. In researching addiction and end-of-life care, the authors also came to realize that it was quite common for hospice team members to have a high incidence of addiction within their own family unit. This makes sense as many of those who go into a caregiving profession were inspired or driven by their own personal or family history of addiction. But it’s important to recognize that this changes the dynamic of the professional relationship. According to the book, this means caregivers may be more likely to project some of their own thoughts and feelings on to the patient, the family, or the situation as a whole, and that can skew the way treatment is handled. It may even mean the issues of addiction are not recognized or addressed. Lastly, Bushfield advises social workers to be observant and to take a step back from what’s happening within the family unit. Failing to do so makes it easy to start pointing out the person with the addiction as the “one with the problem” if the rest of the family has been doing so, Bushfield says. But she hopes that social workers can look at the family unit as a whole and remember that no one lives in a vacuum. Social workers, along with other members of the hospice interdisciplinary team, are wise to avoid both blaming and shaming.